Blood Bowl is a game that's very near and dear to my heart. I played the hell out of the original PC game years ago and even played the table top game a few times. There's just something magical about the idea of a football game set in a really brutal fantasy world that I freakin' love. Blood Bowl: Legendary Edition adds 11 more playable races to the league bringing the total team count to a massive 20! There's also a new Story mode that casts players as a coach and bounces them between a few of the teams leading up to a championship game. The new mode also unveils the history of the Blood Bowl league and it's world. Cyanide and Focus Home Interactive are pleased to present today yet another race of the 11 new ones, joining the existing 9 previous races in Blood Bowl: Legendary Edition, due out at the end of the year! Although fragile, the Amazon players dodging skills help them to slip past most of the dangerous situations encountered on the pitch. They are a well balanced team, similar to the Human team, but benefit from a game of constant movement, supported by the impact potential of their Blitzers. But do not be mistaken, the Amazon players are not soft by any means, and Blood Bowl holds no secret they do not know! A brutal team sport unfolding in a fantasy world based on Warhammer and American football, Blood Bowl is an incredible, brutal game in which no holds are barred as you lead your team to the Blood Bowl final! Blood Bowl: Legendary Edition is the ultimate Blood Bowl edition! 11 new playable races join the 9 races already available in the 2009 edition: Undead, Amazon, Ogres and 9 other races enter Blood Bowl's tournaments. All 20 races have their personal style, tactics and unique skills which give each game a diversity rarely seen in a strategy game. New and more impressive stadiums welcome all these new teams: from the snowy Norse stadium to the creepy interior of a crypt, a change of scenery is guaranteed! A new Story mode is also introduced, in which players will play as a freelance coach. They will have to lead several famous teams and take up many challenges through a story revealing the origins of Blood Bowl, the Old World and its many races that relentlessly compete with each other in merciless games. A newly scripted tutorial will teach all new comers everything they need to know about coaching a Blood Bowl team! In order to stay as close as possible to the official rules, many additions and updates have been made to better match the latest Blood Bowl Rulebook, used in all official board game official tournaments. 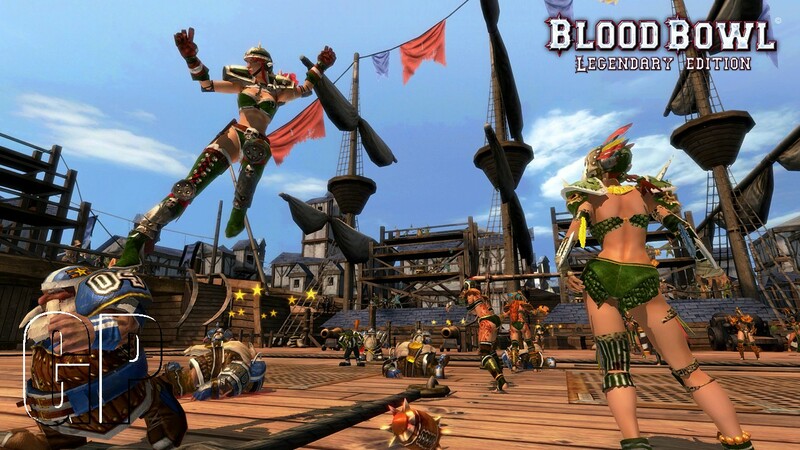 Blood Bowl: Legendary Edition is planned for release on PC Q4 2010.